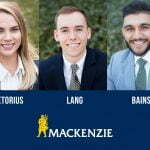 MacKenzie Commercial Real Estate Services, LLC is pleased to welcome Yolande Pretorius, Garry Bains and Michael Lang to the MacKenzie family. MacKenzie continues to expand their market—particularly into the metropolitan D.C. area—and the addition of Yolande, Garry and Michael will be welcomed as they help to build tenant and landlord relations, work to generate leasing prospects, identify market opportunities for represented clients, and support business development initiatives. Yolande will work from the firm’s downtown Baltimore office actively representing clients throughout the Greater Baltimore Metropolitan area and will be partnering with Senior Vice Presidents Terri Harrington and Karen Deeley. Prior to joining MacKenzie, Yolande worked in the Tenant Representation Division of JLL, a commercial real estate agency in Baltimore. She is a graduate of University of Baltimore with a bachelor’s degree in business administration. Garry will work out of MacKenzie’s Columbia office, focusing on business along the I-95 Corridor and south to Prince George’s and Montgomery County, and will partner with Vice President Josh Rosati. Having recently graduated from University of Maryland, College Park with a bachelor’s degree in economics, Garry was previously responsible for marketing, sales, maintenance, and tenant affairs for his family portfolio, which he helped grow to over 200,000 square feet. Michael, who will work with MacKenzie’s Bel Air team, formerly worked with MacKenzie’s Baltimore County brokerage team, as well as MacKenzie management, as an intern. Having recently graduated from Towson University with a degree in business administration, Michael also received his Maryland real estate license in 2017. For more information on Yolande, Garry, and Michael, please visit MacKenzie’s Team page here.